The story started way before my first trip to Fiji in 2010. My name is Paul Atkin and as a free spirit would have it, I have lived, travelled, and holidayed in various countries across the globe. And I continue to, to this day. This was the case with Fiji. After having relaxing getaways in such exotic places as Australia, New Zealand, Mexico, Hawaii, Vanuatu, Bali, Thailand, Philippines, Malaysia, Japan, Hong Kong, and a few more, I knew Fiji was the place for me. To use a well worn cliché, I had found paradise! 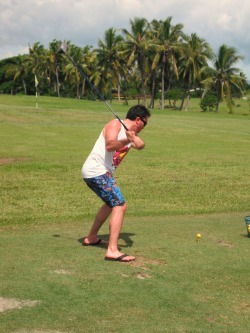 Yes, that less-than-flattering photo above is of me causing damage on a golfing range on the main island of Viti Levu. It was soon after this first trip, that I wanted to find a way to spend more time in paradise. 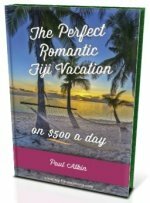 What better way than to experience, research then write about Fiji and to share, from an unbiased point of view, how to best enjoy one of the most amazingly exotic island nations on planet Earth. Yes, Fiji looks just as spectacular in the air as it does on the white sanded ground! As I'm writing this, my site that humbly started in early 2012, is just a year and a half old. 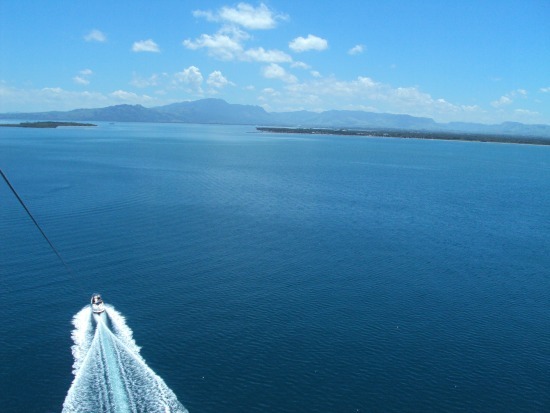 Just a tiny way along my journey of showcasing Fiji through my information site. Fortunately for me, I have found something that I truly love to do. This isn't work for me, work = play! Sooner rather than later, you'll hear me setting up a fixed abode in a remote location in Fiji, using it as a launchpad to continue with my odyssey.